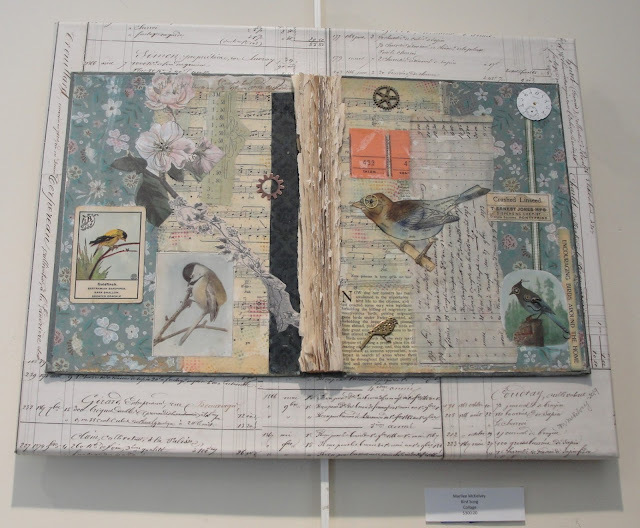 For the month of March there has been an art show at Brewster Ladies Library. The show ends this Saturday. These are my two pieces on display. I made the four panels on French ledger paper from the 1890's. I wet the paper and added color ink to get backgrounds for each season. I stenciled the tree trunks onto cream colored cardstock, cut them out and pasted them to the ledger paper. I used a coordinating stencil (both from Stencil Girl) to add leaves. Then I added paint & paste embellishments. Winter has texture paste thru a small dot stencil for snow. Photo a bit fuzzy, but you get the idea. Winter was easy, Summer was easy, Spring took two tries to get the background and Autumn was a bear. I actually made that panel three times before it looked right with the other ones! I covered the edges of a canvas with more French ledger paper, painted the inside a tan color and glued my panels in to give it the look of a shadow box. 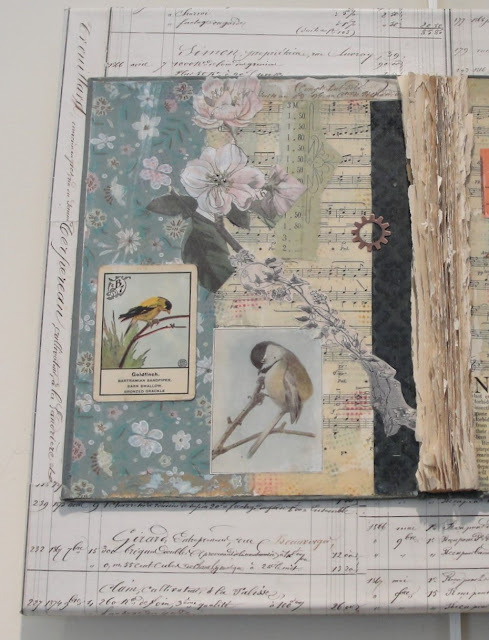 This collage was made on a book, whose pages were torn out. Due to the way the Arts Council requires art to be hung I couldn't add a hanger to the book. 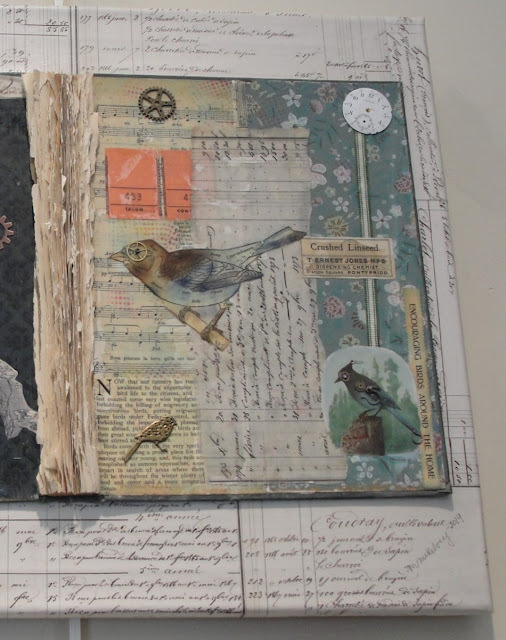 So, I glued the finished book to the front of a 20"x16" canvas, covered in more French ledger paper. I was in the midst of Zero Procrastination, an online course taught by Karen Kingston, when these pieces were due. And yes, I did wait til the last week and a half to start them. What I didn't know is that the course would provide me the space to have a life-changing "ah-ha" moment, where I remembered when my procrastination began. It's not something touted in the class info, I didn't expect it. 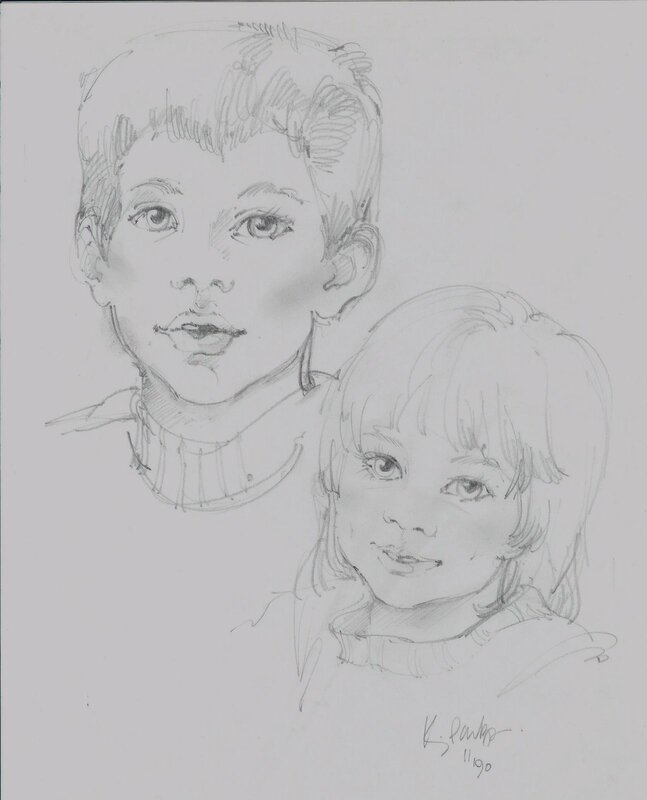 But having that realization allowed me to work on these pieces steadily and easily and get them delivered on time (in fact I was the first artist there!). 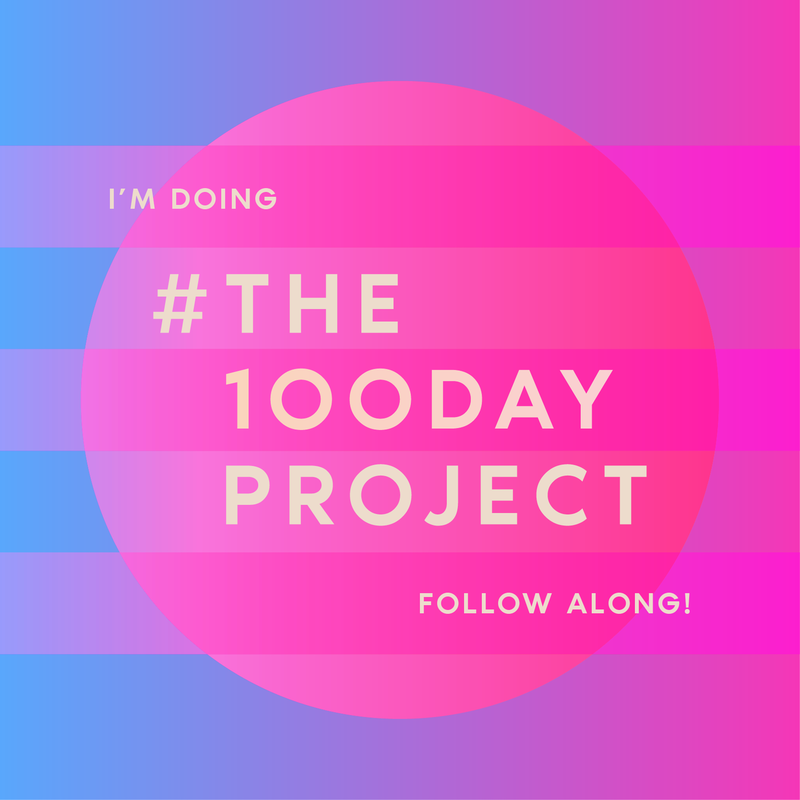 My usual refrain is, "I wish I had more time to ... (fill in the blank re project due yesterday)" This time I was only sorry I didn't have more time because I was having so much fun creating! A couple years ago I saw a woman at Michael's with a book showing the art supplies she owned. I thought the idea was brilliant and stored it away. In my studio, this is the view from my worktable, usually without the catalog. The pretty vignette makes a nice background though. The beginning of the notebook with all the books in it. Each book is dedicated to a tool I use: COLOR, STENCILS, DIES, STAMPS. There's a skinny little book in the middle with my themes & sentiments list; info on scraprack pages -- their sizes, what I have -- and space to add an index. with a note whether I have a mini, reinker, oxide, archival. Gelly Roll pens & Sharpie paint markers. 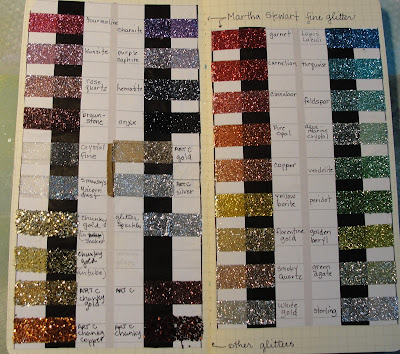 Cut a piece of double sided tape (mine are 1/2"), sprinkle glitter on one sticky side, put extra glitter back in its bottle, remove other sticky side and affix to Peek-A-Hue chart. 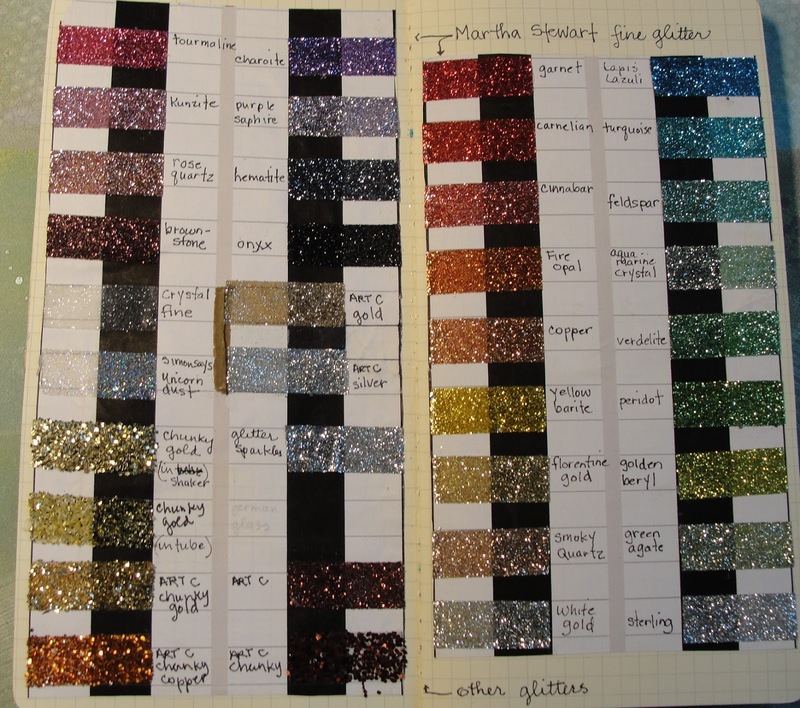 Making the color book has been my favorite! Who knew I had so many stencils? I needed 3 books dedicated to stencils. 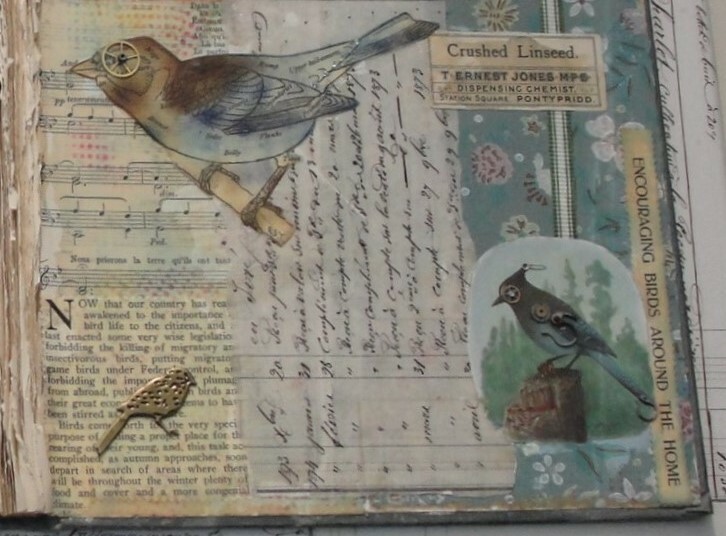 Tim Holtz and 6x6 stencils fit on a single page. Larger stencils take up a full page spread. This set of Stencil Girl stencils work together. I had a lot of fun playing to create the above scene. Also useful, getting to see them altogether! One book is enough for dies and punches. Adding stamps to a book lets me see what I have. I have a real weakness for stamps, specially on certain themes (birds, beachy bits, travel). Now I can see I don't need any more stamps on those three topics, tho I'm not sure it's gonna stop me from purchasing more! I have also discovered which stamps I will NEVER use! They are now in the give-away box! When I have a specific place for things (stencils, un-mounted stamps), I have noted that place in the book. As I organize the rest of my studio I will make a note in my book where tools & supplies are kept. It's been fun to play with my supplies, find out what works, what doesn't, what I will use and what I won't. And when I'm stuck for what next to do creatively, I can always add something to my catalog. I had such a wonderful time, taking two classes and selling in the vintage market. . . and while I was reveling in the friendships and cameraderie, I did not take very many photos. A blog for me is all about the photos, so I am definitely gonna have to get used to clicking the camera everywhere I go! Our days started with breakfast. They always seated me at a table with others, so I got to meet a lot of people I didn't take class with. Marjie is an amazing mixed media collage artist. Tips and tricks to photographing your project for a class. And how to make a video of ourselves teaching. I may yet get pulled into social media for my business. . . oh my! My booth at the Art Trunk. What was best about selling is that things I knew should have a market out in the world, actually sold here! A new friend directed me to a site where more things will sell. Sales and new friends, what could be better! Click on her name to see photos from all the classes she taught. Working on four gels at once. . .
. . . I'm gonna need some more gel plates! The Rock, as a way to understand color theory. How I love Carolyn's sense of humor! When your work does not go as planned. I don't wear gloves, so you can imagine what my hands looked like during this class. (I know, more photos needed). Teachers having a last breakfast together. The next Art is You on the US East Coast will be in 2020. I'd like to be there, who knows, maybe even teaching! Scrabble tiles & Bingo discs, rusty hinges, washi tape, French treasures, photos, buttons, and lots and lots of vintage paper! I really need to get this photo formatting under control! Oh well, it's really early and I wanted to post this before I need to drive to Stamford. Hope to see some of you there! 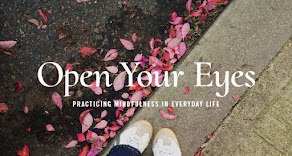 Open Your Eyes, Practicing Mindfulness in Everyday Life. I love her classes! What I love about them is how much they make me think and how much they make me examine my thoughts, feelings, and beliefs. Not only about the subject of the course, but about me. She does it in a way that's thoughtful, spiritual, practical. The topics she teaches about are all personal, but nothing ever seems self-indulgent. Don't get me wrong, certain self-indulgent things -- like bubble baths -- are great. But when doing personal growth work I like how she moves the class along, pushing us all to think deeply about what is really important. That's my take anyway. This particular class feels to me very much like coming full circle. You see I first learned about Susannah the second year I participated in One Little Word. Choosing a word each year to focus on, to think about, to guide you is a wonderful international phenomena. Online groups are formed, classes are taught. I discovered Susannah had a workbook to assist people in choosing their words. I really liked her style and found the workbook so helpful in choosing my word that year -- Mindful. 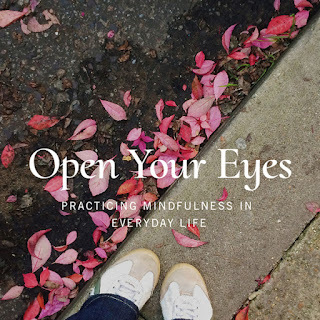 I look forward to adding to what I learned about mindfulness and even looking back to see how that word, that practice grew. Click over her to find out more about her. If it speaks to you, I highly recommend you sign up. I don't think you'll be disappointed! This summer I participated in Susannah Conway's Summer School as part of The Inside Story. 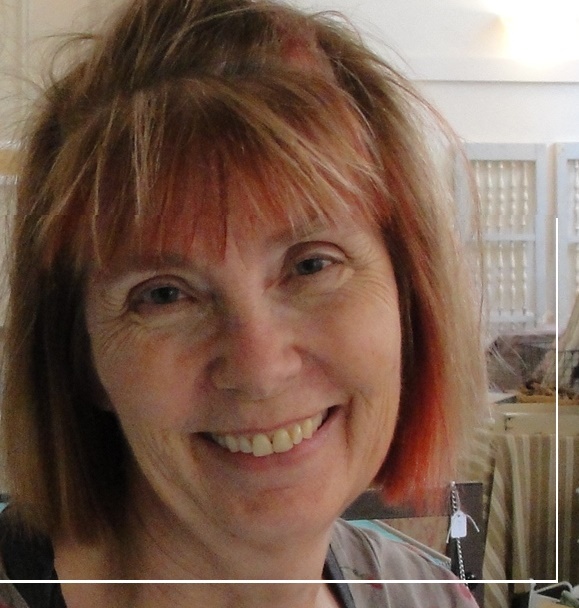 This is me -- a maker of pretty, crafty, decorative things. I am also a wife, a mom, an artist, a gardener, a reader, a traveler, and a loyal friend. So how to become visible, allowing my work, allowing me to be more visible? I changed the URL for my blog to use my name. I already have two posts! I left the old blog up and directed people here. I've made a friend of mine an accountability coach. I purchased a new computer with enough memory to save photos. I'm looking at all the things that stop me. And focusing on all the things that keep me going! When I first started my blog I wanted to be known, sort of, and still be kinda anonymous Marilee is just not an anonymous name, and I was hesitant to use my whole name. And then I've always had a bit of conflict over my married name vs birth name. However, lately, I've wanted to be more visible in the arts and crafts world. So using my name, I changed my URL. And instead of transporting the whole other blog with all it's time gaps and such, I decided to start fresh. I was going public in this very small little way. I got to thinking. What if your going public is not some small thing? What if it's a big secret or something difficult? How hard is it to go public? I've been thinking about this a lot lately, specially with women coming forward with their #MeToo stories. And as I read these brave women's stories, I know it could have been me. That's me on the right, my future husband on the left. 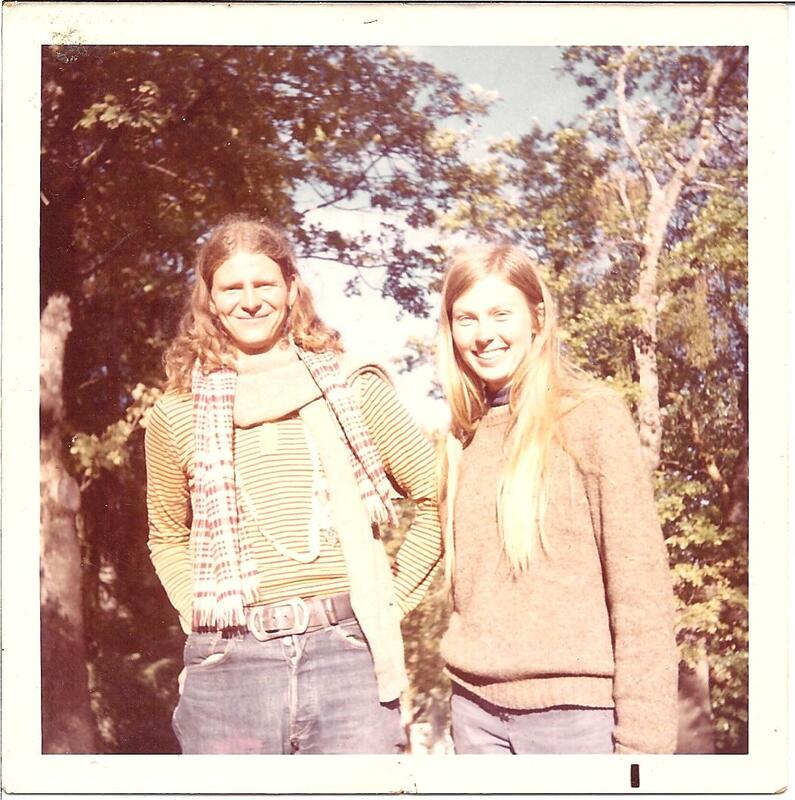 I went to college in the late '60s, early 70's and I thought of myself as a fairly typical college student. There were 5 colleges right next to each other in that charming town. 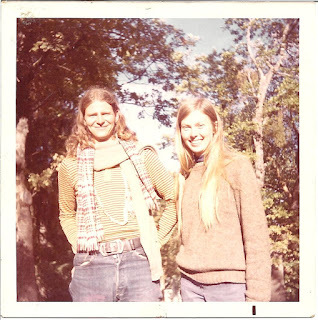 Mine was a hippie womens school. The other womens college served tea every afternoon outside their library; a library with a fireplace that actually worked! There was a school with a great theatre dept and lots of cute guys. I hung out with the theatre crowd. I hitchhiked halfway across the country with two women friends. When we got home I hitchhiked around Southern California alone. I was really and truly protected. I was not abused or threatened or hurt. One driver did suggest I looked tired and wouldn't I like to go to a motel and get some rest. At the next red light I quickly got out of his truck and walked the opposite way he was driving. I've been thinking about this somewhat wild college past of mine. I did some things that could have turned out quite badly. Friends and strangers, women and men were often protective, making sure I got home in one piece or had a safe place to sleep. I am very grateful for all this protection. But before college I had more than one #MeToo experience. I recognize how difficult it can be to talk about. How coming forward is not always treated kindly; sometimes it's almost worse than what happened. I was fortunate. I always thought "something" happened when I was little. I had some disturbing dreams in high school, and in college, I finally got the nerve to talk to my mom about them. Did she know if I could have been molested? She didn't know. I can't remember. But she didn't say I was making things up. She told me about the year I was 4 and suddenly lost a lot of weight (and I wasn't sick). She told me about the day care center I stopped wanting to attend. She took me seriously. It's what we have to do with any woman or man who is coming forward with their stories.